Turn on and off your personal computer peripherals, save power and money. A line switch for the PC. With USB interface and software for Microsoft Windows ®. Your PC always up to time! A DCF77 radio clock for the USB interface. Includes software for Microsoft Windows ®. A cable break and loose contact tester. 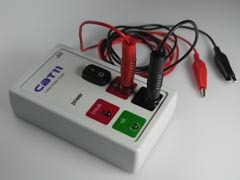 The little bit different "connection tester" helps to track assumed cable breaks and loose contacts.